When you are researching new kitchen ranges, there are many options to consider. If you love to cook, a dual fuel range might be the perfect choice. What is a dual fuel range, you ask? Dual fuel ranges are ranges that use gas to operate the top burners only and have an electric convection oven. This configuration gives you the best of both worlds in terms of performance, which is why it is commonly found on professional ranges. In this article, we'll go over the details of dual fuel ranges and review two top-selling models available at under $4,000. To learn more about gas and electric ranges, check out our range buying guide! So, what do you need to install a dual fuel range? Since dual fuel ranges use both electric and gas, you'll need a natural gas or propane line and a 240 volt electrical outlet to connect to. Unlike regular gas ranges that run on 120 volts, these ranges require the power of 240 volts for the convection oven. What about pricing? The old saying "You get what you pay for" holds true when it comes to these ranges. As mentioned, dual fuel is the best of both worlds. Consequently, you'll pay more for one of these ranges than you will for a traditional gas or electric convection range. These ranges tend to start at around $2,000 and go up from there. Our most popular models tend to be in the $3,000 range. Super-premium models from luxury manufacturers can run $10,000 or more. One of the least expensive dual fuel ranges that has been a top seller for us is the GE P2B940SEJSS, a 30" free standing dual fuel convection range with a built-in warming drawer that is priced at $2,299. This wifi connected appliance syncs with a GE Professional over the range microwave via ChefConnect so that ventilation adjusts based on the stove's burner output. 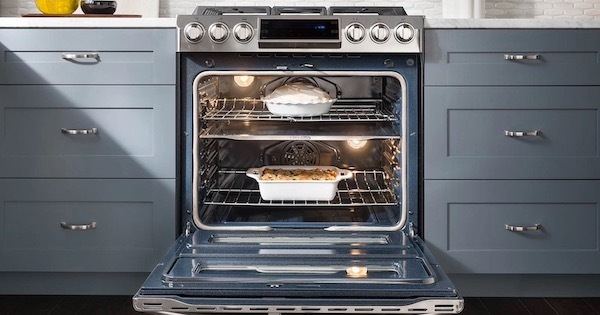 The True European convection oven includes a temperature probe and warming drawer plus a heavy-duty self-clean roller rack so you can easily remove even the heaviest of dishes. The edge-to-edge cooktop is easy to clean, and the heavy-duty grates can be placed in the oven during the self-clean cycle. Imitating the dual-size burners of smoothtop ranges, this model offers a 20,000 BTU tri-ring burner. It also has an integrated reversible cast iron combination grill/griddle that sets up on the large center burner. This center burner is a combination of an oval/round burner for handling oversized pots, the griddle, and more. This model is well worth the price and has sleek professional styling, too! You can also find a slide-in range version of this model, the GE P2S930SELSS, at $2,999. Click here to read over 45 real customer reviews of this product! This next option is more expensive, partly because it's a slide-in model with no backguard while also being a downdraft range. 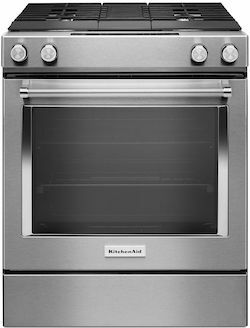 The KitchenAid KSDG950ESS retails at $3,699 and has a ton of premium features to offer. The stovetop offers four burners from 5,000 to 17,000 BTU and the oven is on the larger side at 6.4 cubic feet. Use EasyConvect Conversion to automatically adjust conventional recipes to convection settings, and enjoy the smooth roll of the SatinGlide Max Racks. A steam rack allows you to add moisture to the inside of the oven when needed to get better cooking results. Even-Heat True Convection ensures that your entire oven is heated to the perfect temperature. The AquaLift steam clean feature offers an alternative to the hours-long high-heat self clean: in less than an hour and with temperatures below 200 degrees, you can take care of baked-on spills in no time. Combined with gorgeous industrial-inspired styling and glass touch controls, this model will look great in your kitchen and be a pleasure to use. 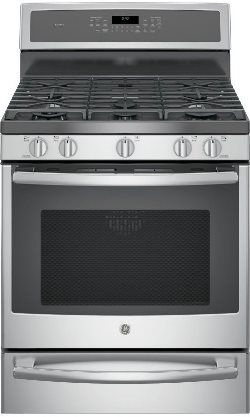 The GE Professional model offers a more advanced feature package with the unique burner options and self-clean grates and racks, but this KitchenAid model is a great choice if you're looking for a downdraft slide-in option with dual fuel. Click here to read over 130 real customer reviews of this product! We hope this helped you explore the dual fuel range options available to you. 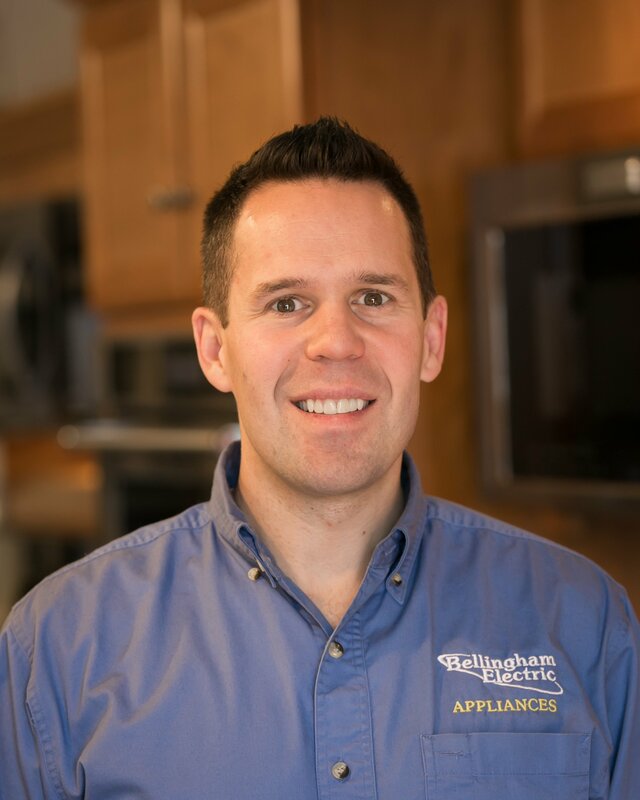 There are a lot of great choices from brands like Samsung, Bosch, LG, Frigidaire, and more in addition to KitchenAid and GE Appliances. Why are you considering a dual fuel range? Leave us a comment below - We'd love to hear from you! Editor's Note: This blog was originally written in March of 2018 and has been completely revamped and updated for accuracy as of the publication date noted above. Convection Oven vs Conventional Oven - Is Convection Worth the Money? Will a Steam Clean Oven Really Clean? Why Choose a Self Cleaning Range?